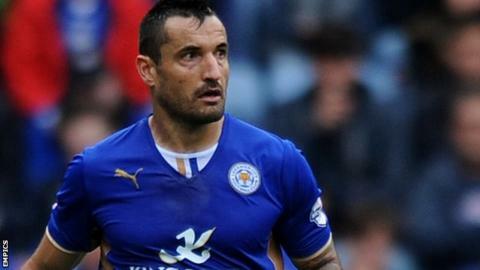 Poland defender Marcin Wasilewski is the latest of five Leicester City players offered a new contract by the Premier League-bound club. Striker David Nugent, goalkeeper Kasper Schmeichel, winger Lloyd Dyer and 20-year-old forward Tom Hopper also have new deals to consider. Winger Dyer, however, looks set to leave the club after contract talks with Foxes broke down. Meanwhile, defender Sean St Ledger is among seven players to be released. Republic of Ireland international St Ledger, 29, made just one league appearance in Leicester's Championship title winning season. "At the moment I haven't a clue what the future holds," St Ledger tweeted. Other player to be released include Zak Whitbread and Neil Danns, who has already agreed to join Bolton Wanderers. George Taft, Jamie Anton, Ben Frempah and Robert Paratore have also left the development squad. James Pearson, son of Foxes manager Nigel, is one of 11 development squad players offered contracts.